By Leah Schade. Works with the premise that all of Creation, including humankind, needs to hear the Good News of Jesus’ resurrection in this age in which humanity is crucifying Creation. Equips preachers to interpret the Bible through a green lens, become rooted in environmental theology, and learn how to understand their preaching context in terms of the particular political, cultural, and biotic setting of their congregation. 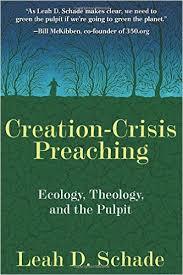 Provides both theoretical grounding and practical tips for preachers to create environmental sermons that are relevant, courageous, creative, pastoral, and inspiring. Learn more.